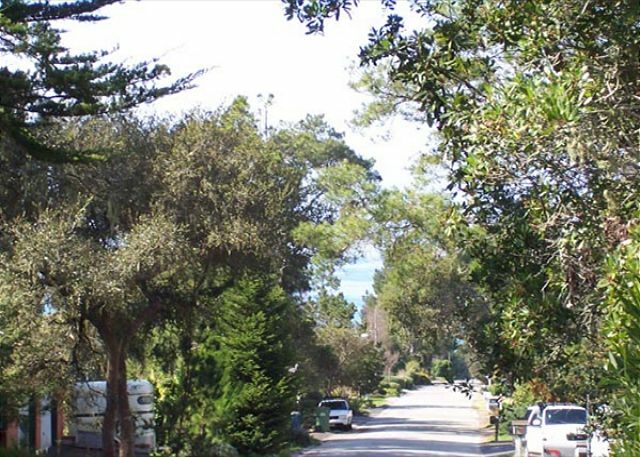 Charming home located in the pines of Cambria with peeks of the ocean through the trees. The pleasant two story home is both short distance to town and Moonstone Beach Dr. Upstairs you will find the simple living room with a game table, dining area, kitchen and the master bedroom. The master bedroom has a private bath with a sunken bath tub, plus a walk-in closet, and its own private deck. Off of the living room there is a relaxing deck looking out towards the pines. Downstairs you will find the other two bedrooms and a bath. No smoking, no pets. NIGHTLY MINIMUMS VARY SUMMER AND HOLIDAYS. This is very nice and spacious house, everything is very close. You can walk to village, at the same time it is very quite at night. 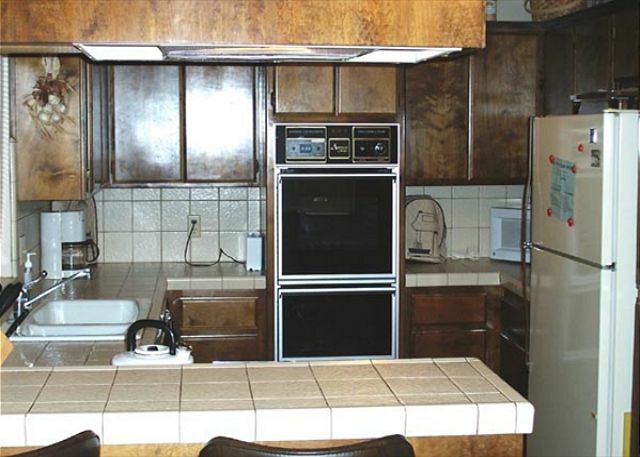 Kitchen is very nice too with everything you need! The house was well maintained, and provided a great getaway. The area is quiet and relaxing. Everything was clean, and good customer service. No problems at all. Would recommend this rental. we had a great time with our family at the coast. 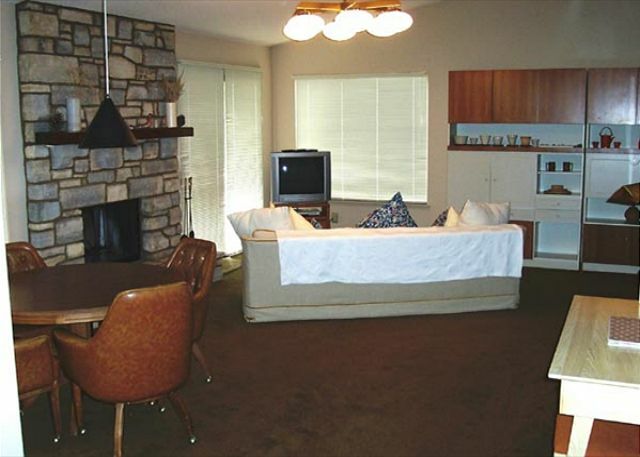 the house was clean and very comfortable, and we would recommend this property to our friends. Relaxng! We have been going to Cambria since 1990! Its home away from home! We even have our kids and their families going there when there time allows! We have been renting from Coastal Escapes for many years! They are most reasonable, friendly staff and accomadating when we havd special requests. This home on Weymouth is one weve used more than once. Its well appointed, clean, comfortable, reasonably priced and close to everythng!! The house is very nice and warm. Rooms are clean. Kitchen is a good size. It has everything you need! We like a fireplace, it was very nice that we could use normal wood in it. The only thing was not satisfactory is no access to the forest that are just behind of the house. Everything at this street is surrounded by fences, so no access to the trails. Perhaps owner consider to make a path to the forest at the back of the garden. The rest was great! To celebrate our birthdays four of us girls, who have been friends for 50+ years, decided to visit Cambria. We were very pleased with this rental and the price was fantastic. Will definitely return. The only negative was there was a short supply of face and hand towels. House was very clean and spacious. The only things I would like to point out is that there is a musty smell downstairs and the house had an ant problem in the kitchen area. Other than that I would recommend this house to anyone and would stay here in the future again. I loved this place. (I could easily live there!!!) It was perfect place for us without being too expensive. It was cheaper than the hotels in the area. Kitchen had everything you need and more. Bed was comfortable and that is a must since I have a bad back. There was firewood for a fire. I felt really at home. The only down side and why I gave the general condition a 4 was, the downstairs was very musty. I have allergies and that was a little bothersome. Upstairs in the living area and Master bedroom there was no smell what so ever. I still would go back though! We had a great experience. The house was very clean, neat, and had everything we needed. The beds were comfortable, kitchen well supplied. The surrounding pines were nice, and just a short walk to Moonstone boardwalk. We would highly recommend this house to other families. a guest from THOUSAND OAKS, California does not recommend this vacation rental. We've been renting from Coastal Escapes for years and will continue to do so. This was our last-minute decision for Thanksgiving week and the last property available. The house is very well maintained. It borders on a teen camp that appears to be unoccupied during the school year. Unfortunately, the walls are paper-thin and we could hear everything from dogs barking (at all hours) to the neighbors' conversations. We didn't spent much time at the house so it worked for us. Nice place. Better than it looks on the website. We stayed at this house for two nights. Our original plan was to stay at a Morro Bay Motel, but we changed our plans last minute. We are a family of 5 and were looking for some more space and the possibility to prepare our own meals. This house and also Cambria turned out to be a pleasent surprise. Nice little town and beautiful walks along the beach. Also the elephant seals just after San Simeon is a must see. The house has a nice atmosphere and is well equipped. For the future availability of WiFi would be nice. Great Place to Stay for Low Price! House was very clean with lots of room for parking. Had everything you needed for a family. Liked that it had a built in gate on the stairs for small children. Will stay here again. Perfect vacation in every way! I love working with the folks from Coastal Escapes! I've had wonderful experiences every time we've stayed in their properties! Location was wonderful, and would stay again. The staff for Coastal Escapes couldnt have been more helpful or more friendly. I loved the whole experience, especially Diedre! Such a great person and employee! The property was extremely beautiful. My family came from Arkansas and Kansas and had a wonderful time. I have reservations for August and am looking forward to that trip as well. Thank You again Coastal Escapes!!! 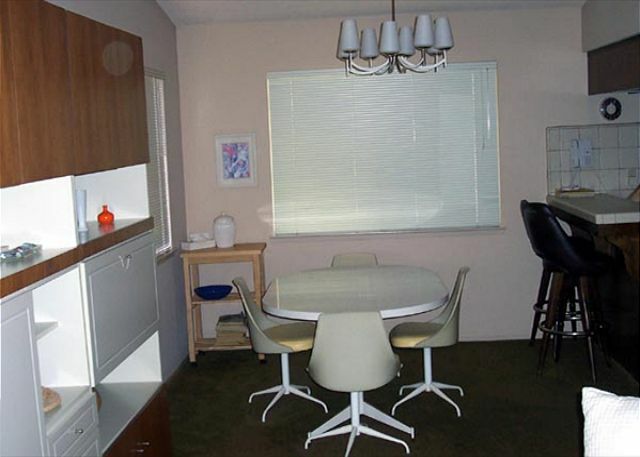 This house was extremely clean and well-maintained. All the lights and appliances worked, kitchen and bathrooms were fine. Nice assortment of books and games. Overall an excellent vacation property, highly recommended! I would given the property a perfect 5. Except that when we arrived it had musty smell from being locked up. We opened all the windows and it was alright. I suggest airing the house before the guests arrive. After all first impression always lasts. The location is perfect. Surrounded by the woods and the benefit of an ocean view! Deer came right up in the driveway a couple of evening. Several wild turkey in the back yard on occassion! It was peaceful and so much to do in the area within 20 miles north or south. The home is cozy and well appointed. The neighbors were friendly. I appreciate that the owners open their home so that others can enjoy such an inspiring central coast experience. The only negative we found was that there is no shower in the master bath. This caused us to use the downstairs bathroom to shower. Not a big thing and everything else was great. Office staff were very helpful. Thanks so much to whoever sent on my granddaughter's forgotten blanket after we left it!!!!!! tHIS HOUSE WAS A LOVELY PLACE TO STAY. iT HAD GREAT ACCOMIDATIONS AND WAS STOCKED WITH EVERTHING YOU NEEDED. i WAS VERY HAPPY THAT THE REFRIGERATOR WAS EMPTY . cOASTAL ESCAPES HAS A LOVELY , HELPFUL STAFF. 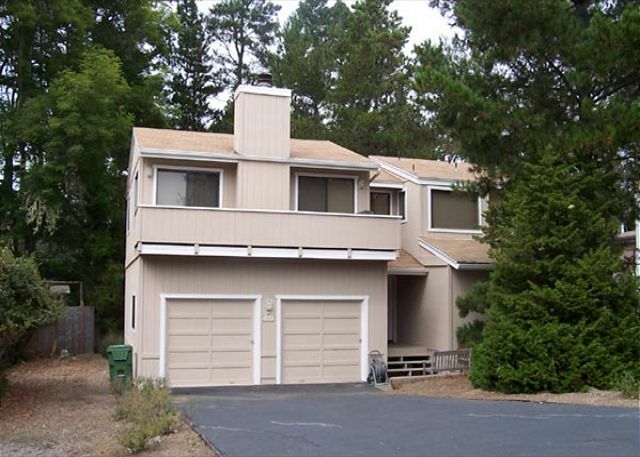 We loved the location, walking distance to Moonstone Beach, dinners, etc. The house was cozy and had everything one needed,we enjoyed being able to have some meals in. The house was neat and clean, only two minor things in our opinion, a few ants in kitchen and the BBQ had a lot of residual grease on it making our first BBQ a little scarry with extra flames. Overall, loved it--will certainly go back. What a lovely week we had in that comfortable HOME with our family, we well remember that time for years to come. Thank You Coastal Property.